Shinwa Regal Green and Black Damascus Steel Katana Sword | BUDK.com - Knives & Swords At The Lowest Prices! 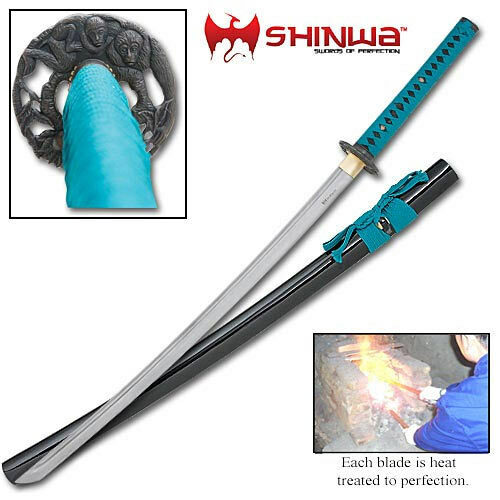 Shinwa only makes top quality swords, and this piece is no exception! Measuring 39 1/4" overall, this beautiful katana features a blade of Damascus steel that has been hand forged at over 1000 degrees and folded to deliver 2000 layers of outstanding cutting power. The 27 3/8" blade is equipped with a heavy blood groove and is build to perform with razor sharp edges on both sides. This sword provides a solid hardwood handle covered in genuine ray skin with green nylon cord wrapping and a cast zinc tsuba, as well as a hardwood sheath. Another fabulous item from Shinwa! Shinwa, KZ6202DZ.